Have you ever travelled to the famous city of Paris and visited the Eiffel tower? Have you wandered the city at night and noticed the Eiffel tower sparkle brightly, along with other tall structures with bright lights lit up? If you have, you may think that these things are no more than just decorations to attract tourists and make the city livelier. Well, this is true, but on the other hand, they aren’t just there for that reason. In fact, those bright lights that sparkle brightly every night have been attached to those structures for a specific reason. 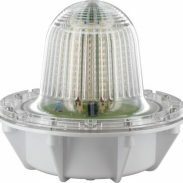 LED and Xenon Strobe lights have been recently developed, improved and modified to meet certain and specific requirements in every field of lighting applications such as vehicle headlights, emergency vehicle lighting, theatrical lighting, alarm systems and obstruction lighting. So this week, we’re going to briefly discuss about aircraft warning lights, their purpose and the different types of lamps used in this application. Aircraft warning lights are lighting devices that are used to make tall structures more visible to aircrafts, especially at night. Tall structures such as an antenna tower, telecommunications tower and radio transmission tower could present a serious hazard to air navigation and are prone to risk of collision, especially for aircrafts flying at low altitude. 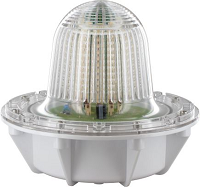 And in order to prevent a worst case scenario, these high-intensity lighting devices are installed on any permanent or temporary structure which could pose a potential hazard to air navigation as a preventive measure. Low intensity obstruction lights – These lights are fixed-red lights typically a flashing beacon or steady burning lights. They are intended for night use only and should only be installed for structures with a height lower than 45 meters. Low intensity obstruction lights are classified into two types, Type A and Type B. Type A lights has a minimum intensity of 10 candelas while a Type B light has a minimum intensity of 32 candelas. Medium intensity obstruction lights – Medium intensity obstruction lights are often white strobe lights typically xenon and flashes around 40 times per minute. Several manufacturers today are developing medium-intensity white strobes based on LED technology to replace xenon because of its longer lifespan, power efficiency and low maintenance cost. These lights are only installed to structures with a height higher than 45 meters, usually between 200–500 feet or 60-150 meters. 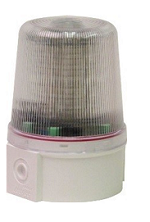 Medium intensity obstruction lights are divided into four types, Type A, Type B, Type C, and Type AB. Type A – These are white colour flashing lights with an intensity of 20.000 candelas during daytime and 2.000 candelas during night time. Type B – These are red colour flashing lights with a minimum intensity of 2.000 candelas. Type C – These are red colour fixed lights with an intensity of 2.000 candelas. Type AB – This type of light is a combination of Type A and Type B lights. These are white flashing lights with an intensity of 20.000 candelas during daytime, red flashing lights with an intensity of 2.000 candelas during night time and are equipped with twilight sensor which automatically switches red light from white light at dusk. Type B and C are usually recommended for night time and Type A for daytime. High intensity obstruction lights – High intensity obstruction lights provide the highest visibility both day and night. It flashes 40 times per minute like the medium intensity obstruction light. These lights are used to indicate the presence of an object and are only installed to structures with a height higher than 150 meters. High intensity obstruction lights are divided into two types, Type A and Type B. Type A – These are white colour flashing lights with a minimum intensity of 200.000 candelas during daytime, 20.000 candelas during dusk or twilight and 2.000 candelas during night time. Type B – These are white colour flashing lights with a minimum intensity of 100.000 candelas during daytime, 20.000 candelas during dusk or twilight and 2.000 candelas during night time. Thanks to these beautiful sparkling bright lights, cities nowadays are safer from air navigation hazards that might endanger human lives. And as mentioned earlier, it serves as an embellishment, making each city livelier and a wonderful place for everyone to wander at night.